It was a pleasant surprise when YAMAHA Europe offered KEDO the opportunity to participate in their ’Yard Built’ competition at the beginning of last year. The assignment was to convert the new SR400, in cooperation with the Danish Design-Team ’Wrenchmonkees’, as part of the support for market launch. 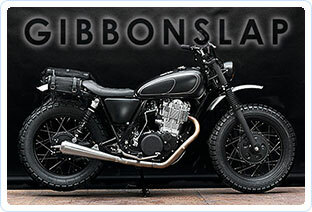 The German based Parts Specials KEDO has now finished the complete kits parts for Wrenchmokees SR400 custom-bike "GibbonSlap". The KEDO/WM kit parts providing a suitable conversion for anyone with reasonable technical ability, a SR400FI and own backyard/workshop. No cuts or major modifications to the frame will be required, all parts are designed to fit straight "out of the box". The conversion can be done in steps. Every step of the conversion can be fully reversed. But we are more than confident that no one would ever reverse it once he converted his bike into a beautiful SR GibbonSlap!